Also available as an eBook in the Amazon Kindle store and on Google Play. This emotionally honest and personal exploration of conflict introduces a creative and compassionate way to develop empathetic responses using the spiritual practice of the moral imagination. 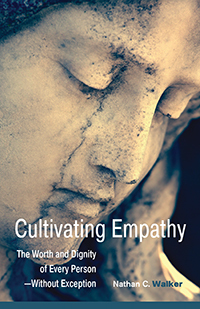 In this emotionally honest and personal exploration of conflict, the Reverend Nathan C. Walker introduces a creative and compassionate way to develop empathetic responses. He explores the concept of the moral imagination—a way we can project ourselves into a conflict and understand all perspectives, aware that understanding need not imply agreement. Walker presents a series of revealing essays about his wrestlings with personal and cultural conflicts and his commitment to stop “otherizing”—which occurs when we either demonize people or romanticize them. His remedy for these kinds of projections is to employ the moral imagination as an everyday spiritual practice. Through his engaging and thought-provoking vignettes, he endeavors to find connection with skinheads, murderers, homophobic preachers, privileged 1-percenters, and Monsanto executives. As he experiments with this approach, he shows a model that can help us all nurture greater empathy for those we have previously held in contempt. When we observe oppression, let us develop strategies that free not only the oppressed but also the oppressor. Let us remember that those who use their power to deny freedom to others are also imprisoned and are also worthy of care. Do not let their unjust actions inspire us to cruelty, or else we will soon become what we set out against. Here is our challenge: let us take up the miseducation of justice-making, by stripping our minds of the idea that equity can be manifested through condemnation, through humiliation, through shame and blame, and through righteous vindication. No, justice-making begins by marrying a just thought to insightful words, inviting us to collective action, by daring to free both the oppressed and the oppressor, for we know what it is like to be both. Stand we must, stand strong and bold. But let us choose a new way to balance the scales. Rather than shoving our foot on oppressors’ necks, let us instead reach out a hand, offer a seat, and show them, and even ourselves, a new way of justice-making by collectively experimenting with the moral imagination.